BEDFORD, Mass., Nov. 13, 2018 — VoltDB, the enterprise-class database that powers real-time intelligent decisions on streaming data, and Openet, provider of digital business platforms and winner of the Most Innovative Vendor Award at the World Communications Awards for its VoltDB-powered Digital Business Platform, will deliver a joint webinar discussing the data requirements for adopting 5G and best practices for how to approach these challenges. The “2019 Planning: Data Platform Requirements for 5G Core” webinar will take place on November 15, 2018 at 10:00 a.m. EST. The new 5G Core architecture will be the center of the new network and will support service delivery over wireless, fixed or converged networks. 5G networks will require a fundamental change to the existing core architecture, redefining how data is represented, collected, stored and used. These new data requirements will force organizations to not only ingest, store and process data in real-time, but also adopt and integrate with machine learning technologies to make the decision-making increasingly more intelligent. 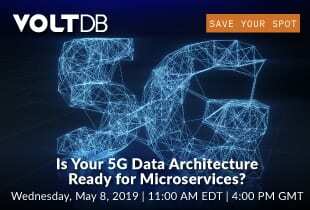 In this webinar, 5G experts from VoltDB and Openet will discuss the primary factors that will influence data processing needs — including consolidation of data layers, software enabled and virtualized network functions, cloud native applications, security considerations, and more — and how to address them. Free webinar with executives from VoltDB and Openet to discuss data requirements of 5G Core and how you can address them going into 2019 and beyond. Openet provides software solutions and services to enable service providers to create new revenues from digital services and improve customer engagement. Our Digital Business Platform enables service providers to be more agile, innovative and enjoy a faster time to value. Since its foundation in 1999, Openet has been at the forefront of telecoms software development and innovation. Our success is personified by the many long-term relationships it has fostered with the largest, most progressive, and demanding operators across the globe. For more information visit www.openet.com.